Manchester practically kidnapped me today which meant that Sheffield didn’t get to see me. I arrived in Manchester last night, staying at the Doubletree by Hilton in Piccadilly. Fancied having a chilled out walk around to scope the place out and see where I could perform. I found Piccadilly square which was beautiful, there was a big fountain in the middle of grass land and it was surrounded by coffee shops….and yes, there was a Costa and a Starbucks just around the corner haha…so it was perfect!!! Domino’s got a phone call last night 🙂 had pizza in my room. I love ‘The meteor’ pizza that they do with BBQ sauce and meatballs, yummy. Thank fully I felt a bit healthier today after a good sleep last night. I was supposed to perform 10am-12noon and then head to Sheffield but the people didn’t want me to leave, so I ended up performing until 3:30pm, wow that’s a long time haha. It was so hot, I got a bit of a tan YAY. The response that I received was really sad, as she told me about her sister who has been diagnosed with cancer, such a young child. It really is heartbreaking. So much great stuff happened today…I got booked for a wedding in Wigan too. I was playing Pirates of the Caribbean which caught the attention of a couple who’s daughter is getting married next year, and having a Jack Sparrow lookalike as a meeter and greeter. They asked me to play The Rose by Bette Middler which I absolutely love…and everyone just stopped and stood/sat in silence, watching. THAT felt amazing. When I finished performing I spent about an hour walking around the square to talk to people that had watched my performance throughout the day. 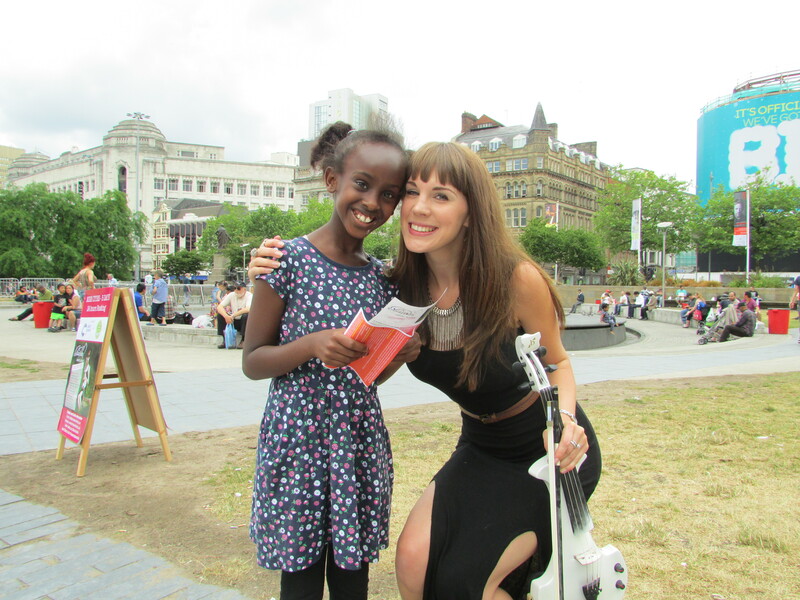 I love the chatting to people, god I have missed busking so much. 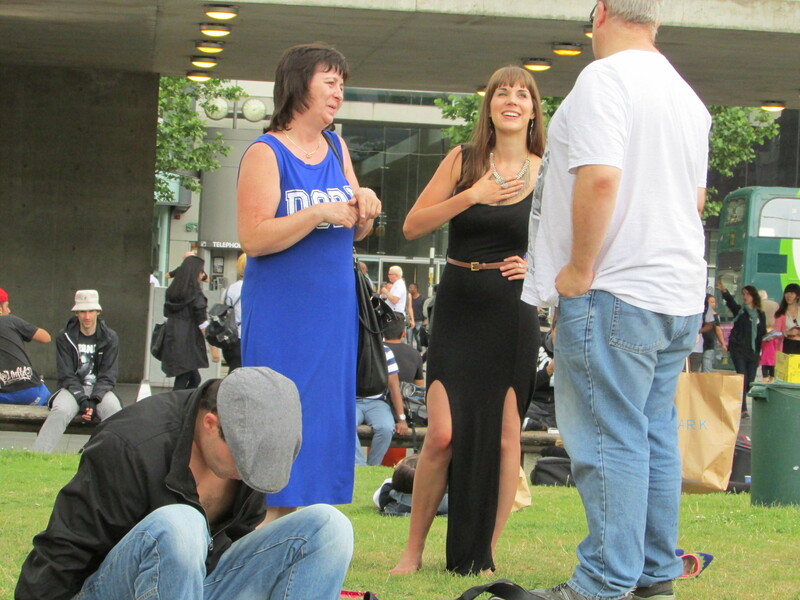 There was a guy from Belgium who sat on the grass listening to my performance for the entire period of 5 hours. He had come over for English lessons, just for the day…I am sure that is what he said. He was really lovely, had a nice little chat, and he bought me a beer haha but I don’t drink beer, and i don’t drink out of a can or a pint glass haha. I was spotted by someone from Cancer Research today who filmed and took photo’s to send to their board director…very exciting. They have asked me to perform with the lasers next year at one of the massive relays that they have. I really hope I’m available, I’d love to do that.